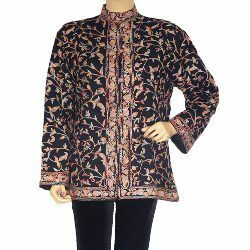 Providing you the best range of hand embroidered coat with effective & timely delivery. We offer a high quality Hand embroidered Coat, We also make Badges for Military, Navy, Air force, Regiments, Sports, colleges, clubs and Associations. Please feel free to offer us any creative custom designs for our making counter samples and quotation thereof for your own satisfaction in all respect. Looking for Hand Embroidered Coat ?